Business success doesn’t happen in a vacuum, and that’s true in today’s world of tech more than ever. Innovative programmers need marketers to get the word out, self-confident sales reps need solutions consultants to answer those impossible prospect concerns, CEOs need CMOs, proposal managers need proposal writers…it takes a village. And that village needs the right tools to stay competitive. 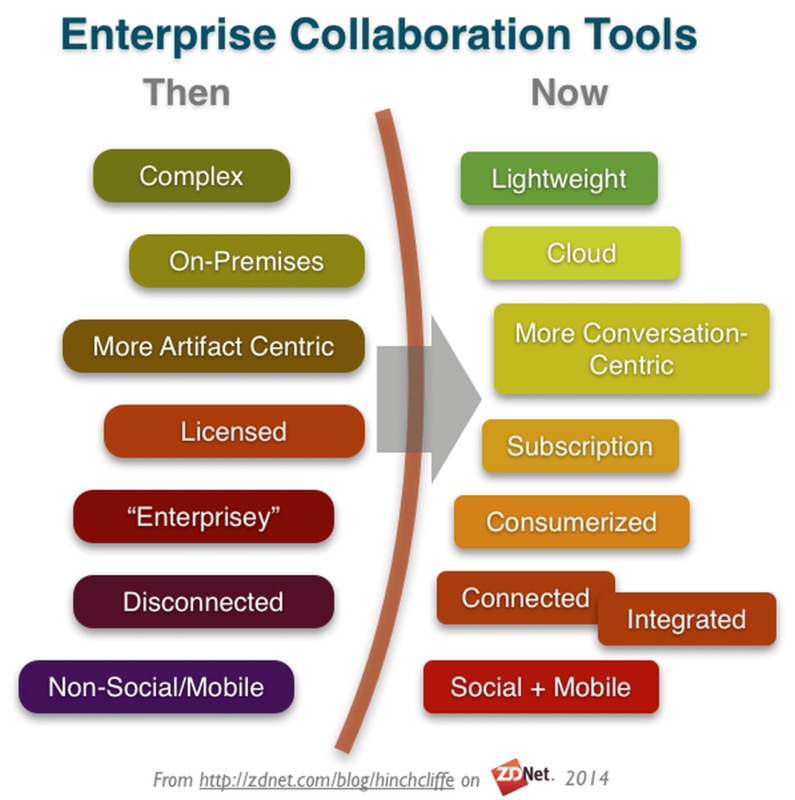 Enter, enterprise collaboration software. We’ve talked about the importance of enterprise collaboration tactics in process. But a key way to make sure your business is running as smoothly as possible is to find and implement enterprise collaboration software (ECS) that aligns not only with your current needs and processes but also your key goals for the future. There’s absolutely no shame in asking for help, especially when that help can increase productivity, improve morale, and reduce costs. Our friends at Smartsheet take a deep dive into enterprise collaboration and choosing the best ECS for your needs, so we’ve compiled some of their hot topics and discussed how great ECS like RFPIO can take your enterprise collaboration to the next level. Did That Really Require a Reply-All Email? One key thing to understand about today’s enterprises is we’re already collaborating all day long—just ask my calendar full of meetings before the work week has even begun. What ECS helps ensure is that our collaboration is smarter and more tailored to getting real work done as opposed to simply abundant. Unless it’s the only line in our job description, nobody feels good about spending the entire day trying to wrangle The Inbox. Enterprise collaboration software removes much of the unnecessary “noise” that results from typical modern collaboration, such as reply-all emails with 10 attachments requiring some kind of attention from someone in the giant email chain. This streamlines project management and keeps your inbox free to hold information that actually belongs in emails. This is not to say email isn’t still crucial to successful enterprise collaboration: in fact, the best ECS (like RFPIO) will leverage your current processes to get work done faster and smarter. For example, an email notification letting you know your expertise has been requested in an open RFP response is a fantastic way to take advantage of email without relying on it to go back and forth about the RFP question at hand, tweaking language, pulling in others who then have to read the entire email chain, etc. We at RFPIO believe hugely in leveraging the right collaboration methods for each unique goal. Integrations with collaboration tools—along with comments and @-mentioning—make RFP response collaboration easier for SMEs without going back and forth via email with small updates to the original information. Staying in close proximity to our work even if we’re not in front of a desktop has become increasingly important over the last few years. We get work done in taxis, on buses, in line at the grocery store. No one screen size owns more than 26% of the market share, and 90% of people move between devices to accomplish a given goal. At the end of the day, enabling productivity means bringing work to you versus going out of your way to get work done: solution mobility and the ability to fluidly move between devices is king. The next generation of flexible, web browser-based enterprise collaboration tools is here, and RFPIO is no exception. If your RFP response contributors are traveling all the time and only like to work on planes with their tablets, your chosen ECS should anticipate that and offer feature parity across every device, not just laptops. Further to that end, integration with third-party applications is perhaps just as important as the ECS’s functional features. Since the goal is ultimately to reduce user effort and bring the work to you, you should be able to utilize every tool at your disposal the way it’s meant to be used. For example, RFPIO lets you consolidate the tools most important for your organization, with bi-directional integrations with CRMs like Salesforce, as well as with cloud storage like Dropbox and communication platforms like Slack. Implementing new ECS doesn’t mean overhauling your existing processes. Slack and Zoom certainly have their place in enterprise collaboration just as RFP response automation does. We could talk about the sexiness of different ECS features all day long, but any new software your business implements still has to comply with the applicable laws and regulations of your industry, not to mention the particular protocols of your unique company. So let’s talk audit trails and why they’re no joke, especially when it comes to creating RFP responses. Everyone loves a good surprise party, but projects with looming deadlines is not where we want someone to jump out of the cake and squeal with delight, “I DELETED WHAT YOU HAD THERE AND REPLACED IT WITH SOMETHING I LIKED BETTER!” Having full visibility into the response’s assignments and activity history can be the difference between putting out last-minute fires and submitting the proposal days ahead of schedule. “Working together” means much more than simply showing up every morning and getting along with your colleagues. Of course, not all ECS is created equal, nor are all companies’ needs. Finding the right software for your unique needs will also be crucial to securing employee buy-in. What’s the point of implementing new software if nobody wants to use it? Involving key departments and players in the selection process can help you make sure everyone is working toward the same mission versus competing against each other for resources, power, attention, etc. “Working together” means more than simply showing up every morning and getting along with your colleagues. True enterprise collaboration signifies that your workforce is dedicated to moving the entire company forward, not just if they have time or if the project suits them. Let’s take RFP automation software like RFPIO. How scalable does it need to be? Has your RFP department been begging for more proposal writers? If you plan to triple your size in the next year, will it be able to grow with you without tripling the price? Will only the RFP department ever adopt it, or do you think others across your entire business can be moved to use it as necessary? Asking these kinds of questions ahead of time will help get everyone on the same page when it comes to planning your organization’s vision for the future. The right ECS for your needs will not only encourage your employees to do their jobs, but also help them see how much more is possible in a day, in a week, in a year when they can collaborate in the most streamlined, real-time ways available today. Ready to collaborate on RFPs? Schedule a Demo with our team.